Useful for nasal congestion with sneezing, and red itchy eyes. Chronic rhinitis, nasal sinusitis, with symptoms of runny nose with large amounts of yellowish, thick discharge (bacterial infection). Stuffy nose, with symptoms of dizziness and headache in chronic cases. Hay fever or other allergies with rhinitis. For pollen and dust allergies marked by sneezing, runny nose, and watery itchy eyes. 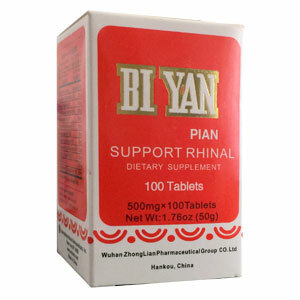 Bi Yan Pian supports the health of the nose, paranasal sinus and respiratory system. Expel Wind-Heat, open nasal passages, decrease swelling, supports the health of the mucous membranes which line the nasal passages. Take 4 tablets 3 times daily. Use with caution during pregnancy, consult your herbalist or physician before use. Keep out of reach of children.